As more and more people switch to browsing the internet via portable devices, it’s no surprise that the browser companies are now focusing their development and marketing strategies on battery life. Nowadays, focus seems to have switched to battery life. The past couple of months has seen Microsoft release a battery comparison that saw Edge coming in first and Chrome last, and Opera Software shipping its browser with a battery saver mode that the company claims beats other browsers. And now it is Google’s time to claim that battery life in Chrome 53 has improved significantly over previous versions of the browser. 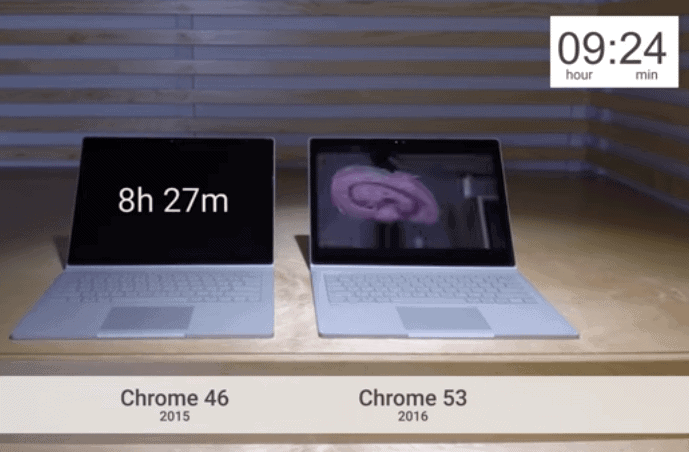 Google demonstrates the improvement with a comparison video that pits Chrome 46 released in 2015 against Chrome 53 released in 2016 against each other. In that video, the device running Chrome 46 dies after 8:27 hours of playing a Vimeo video while the identical device running Chrome 53 dies after 10:39 hours or 2:12 hours longer. Google did not test Chrome 53 against other browsers. If you remember Microsoft’s tests, it did use Surface Books for the testing as well. The company’s browser Edge came in first with 7:22 hours of battery time while Chrome came in last with 4:19 hours. The tests cannot be compared with each other, as different videos were used in the tests. It seems clear that battery time is the new battleground for browser developers, with each claiming the coveted “best in class” spot for themselves. Playing a video non-stop until the battery dies is probably not the best “real world” test that one could come up with to test battery life. Most users are probably not using their mobile devices to play videos non stop. What’s missing is an independent test that pits all major browsers using default configurations against each other in real-world scenarios. While one browser may very well be more optimized than others, it is clear that all users will benefit from this new battleground eventually. Browser developers will start pushing improvements to better their software’s battery life; a process that has already started. This entry was posted on Wednesday, September 7th, 2016 at 10:37 am	and is filed under General News. You can follow any responses to this entry through the RSS 2.0 feed. Both comments and pings are currently closed.